Verizon's LTE network is probably the hottest thing smokin' right now as far as networks are concerned, and, as of today, it has been expanded to nine more major metropolitan areas including Mobile and Montgomery, Alabama; Greater Fairfield and New Haven, Connecticut; Gainesville, Pensacola, and Tallahassee, Folorida; Fayetteville-Lumberton, North Carolina; and Bryan-College Station and Temple-Killeen, Texas. Also included in this rollout is an expansion to five areas that currently have LTE coverage: Atlanta, Georgia; Chicago, Illinois; Denver, Colorado; New Orleans, Louisiana; and Philadelphia, Pennsylvania. 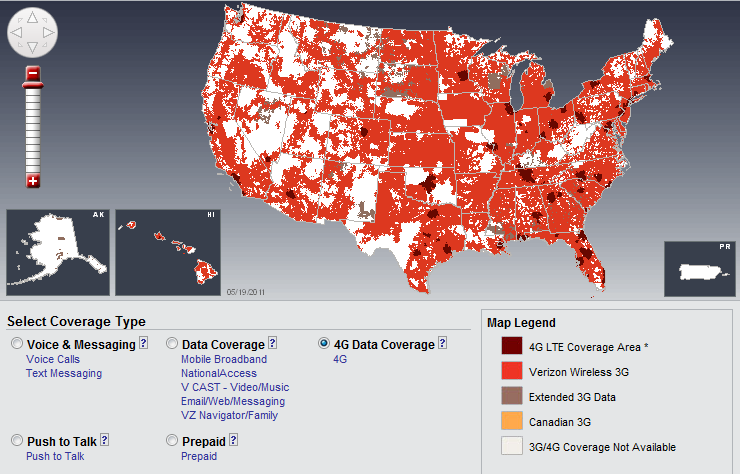 This brings the total number of covered metropolitan areas up to 55 now, which isn't bad considering that VZW just started rolling out LTE in December of 2010. BASKING RIDGE, N.J. – Verizon Wireless is turning on the world’s most advanced wireless network in nine additional metropolitan areas today, as well as expanding the 4G LTE network in Atlanta, Chicago, Denver, New Orleans and Philadelphia. The wireless leader announced today the 4G LTE network is now available in Mobile and Montgomery Ala.; Greater Fairfield and New Haven, Conn.; Gainesville, Pensacola and Tallahassee, Fla.; Fayetteville-Lumberton, N.C.; and Bryan-College Station and Temple-Killeen, Texas. Consumers can choose from several devices to access the blazingly fast speeds of the 4G LTE network, including the newly-launched DROID Charge by Samsung and ThunderBolt™ by HTC smartphones, MiFi® 4510L 4G LTE Mobile Hotspot and Samsung 4G LTE Mobile Hotspot. Laptop users can enjoy speeds up to 10 times faster than the company’s 3G network with three USB modems from Novatel, Pantech and LG. In real-world, fully-loaded network environments, 4G LTE users should experience average data rates of 5 to 12 megabits per second (Mbps) on the downlink and 2 to 5 Mbps on the uplink. When customers travel outside of a 4G coverage area, the devices automatically connect to Verizon Wireless’ 3G network, enabling customers to stay connected from coast to coast. Verizon Wireless’ 3G network is the most reliable network in the country, allowing customers with laptops and smartphones to download and use cool apps, from mobile social networking platforms to GPS-enabled maps. Customers can also can rapidly browse the Web to keep up with news, sports, stock quotes, Hollywood gossip and more, work on-the-go with fast file sharing and stream must-see video and customized radio stations. Customers in 3G coverage areas today who purchase 4G devices will be able to take advantage of 4G speeds when the faster network becomes available in their areas. As the first wireless company in the world to broadly deploy game-changing 4G LTE technology, Verizon Wireless is committed to building its 4G network with the same performance and reliability for which it has long been recognized. Verizon Wireless’ consistent focus on reliability is based on rigid engineering standards and a disciplined deployment approach year after year. The company’s 700 MHz spectrum gives Verizon Wireless specific advantages with 4G, including a contiguous, nationwide network license. Verizon Wireless’ vision also includes bringing its 4G LTE network beyond major cities. The company is working with rural communications companies to collaboratively build and operate a 4G network in those areas using the tower and backhaul assets of the rural company and Verizon Wireless’ core 4G LTE equipment and premium 700 MHz spectrum. Already, 10 rural companies have signed on to leverage Verizon Wireless’ scale for infrastructure while keeping their customers on the cutting edge of technology, including Bluegrass Cellular, Cross Telephone, Pioneer Cellular, Cellcom, Thumb Cellular, Strata Networks, S&R Communications, Carolina West / Clear Stream, Custer Telephone Cooperative and Convergence Technologies. · Greater Fairfield and New Haven, Conn.
· West Palm Beach, Fla. Since 2007, when Verizon Wireless jump-started the global 4G LTE ecosystem with its selection of LTE for its 4G technology, the company has developed deep partnerships to spearhead a broad LTE ecosystem, with many being fostered at the LTE Innovation Center in Waltham, Mass., and the Application Innovation Center, slated to open in San Francisco later this year.